MBA done with a CPA soon to follow... hopefully! I finished up my MBA this past December. I realize this post is delayed, but I was hoping to include a picture of my diploma, but it has yet to arrive. But I did confirm that it is on its way since I had a mini breakdown wondering if I somehow missed a class and really didn't graduate. But it was confirmed that I completed all of my requirements and did gain three little letters to add to my resume. 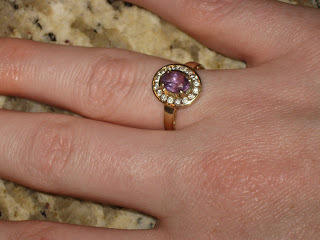 So that this post isn't completely boring, I will include a shot of my favorite graduation present- a ring! I wanted some sort of ring to commemorate my graduation with, but I didn't want the typical class ring. So I decided to get a ring in yellow gold with an amethyst stone since yellow and purple were my grad school's colors. And as an added bonus, amethyst is my birthstone. Now the tricky part of getting a ring was me and my extremely particular jewelry taste. I think things simple, but different. That sounds simple enough, but it clearly isn't since we visited over 12 jewelry stores to find "the one". Here it is in all of its glory! I just love it! And if anyone is considering getting their MBA solely online, I strongly suggest East Carolina University's program. There is very little busy work, completely flexible schedule and you end up learning quite a bit. What a pretty ring! Congrats on officially being done with the MBA!